Beneath the historic Guildhall in the City of London is the site of London’s only Roman amphitheatre whose remains were uncovered by archaeologists over 30 years ago under the courtyard. In August, new gladiatorial battles will commence at the very location where Roman gladiators fought 2,000 years ago. Eight thrilling afternoon and evening events will take place across the August Bank Holiday Weekend, Friday 25-Monday 28 August 2017. 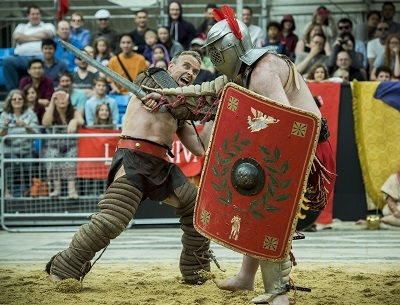 Gladiators in full, magnificent battle dress will enter the arena before packed crowds and fight a series of powerful battles – intense clashes of steel swords, brightly decorated shields, spears and shining armour. The audience will become a big part of the action, taking sides and encouraging the emperor to save or spare each stricken fighter. 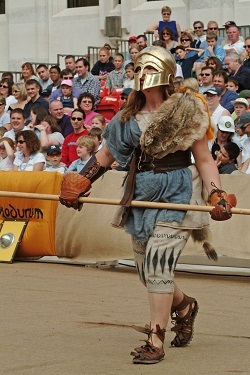 The Gladiator Games are performed by Britannia, the collective renowned for its work on the BAFTA-nominated CBBC programme, Horrible Histories, and the celebrated Ridley Scott film, Gladiator. Each performance is the result of research into events in the 1st century A.D., using images drawn from Roman coins, paintings, sculpture and mosaics, surviving commentaries and archaeological finds. 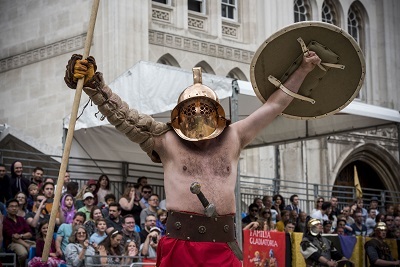 Accompanying the main event will be a special Roman festival, which will bring the audience closer to life in Londinium, the largest city in Britannia from around AD50 to 410 and a major international port. Musicians will perform, Roman clothes and equipment will be made, crafts demonstrated and explained, and the Museum’s experts will invite the audience to examine and handle real Roman artefacts. 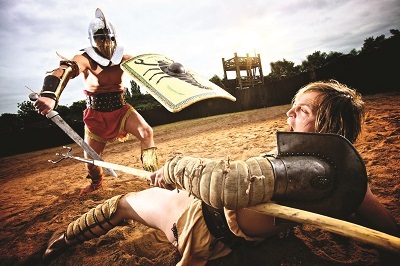 Below ground, close to the ruins of the amphitheatre, there will be a special small display of artefacts from the Museum of London that looks at representations of gladiators in Londinium. 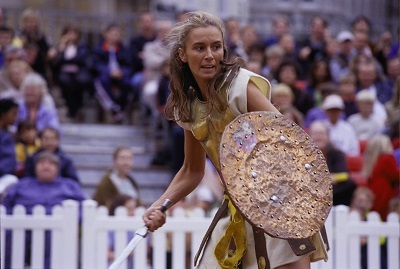 The Games form part of a three-month festival that will celebrate the unique Roman heritage at the heart of the capital, hosted by the City of London Corporation. The festival, called Londinium, is made up of exhibitions, walks, talks, theatre, film and special events, taking place from 28 July – 29 October 2017. By londonvisitors2014 in Festivals and Events on June 3, 2017 .